4. What jewellery do you never take off? As usual for Melbourne it’s all over the flipping place. Today, I started out in 3/4 pants, a t-shirt and thongs and am now wearing a fleecy hoodie, tracksuit pants and socks. I seem to always have one necklace that I will wear for ages and ages before changing it. At the moment it is one that Matthew got me for Christmas. Not really. Occasionally, I will get a craving for something but mostly I’m done after dinner. 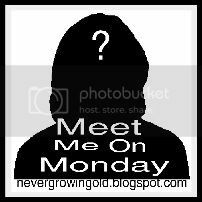 Java has had SEVERAL people link their whole blog and not just the post and it takes a lot of time to go in and correct these so PLEASE link your Meet Me On Monday post! You know who you are!! Found you thru Meet Me On Monday. Wow! 5 boys! You must have an "S" on your chest! I have 3 boys and one princess. Can't even imagine ALL boys! Luvin' your blog and I'll be back! Loved reading your answers! Thank you for visiting and commenting on my blog! Have a wonderful week!